A couple of years ago if someone told you that your blueberries were loaded with anthocyanins, you'd probably have dumped the bowl down the garbage disposal and called 911 to report being poisoned. Anthocyanin sounds scary, kind of like cyanide. Fortunately it's a good word; "anthocyanin" is derived from two Greek words, "anthos " (flower) and "kyanos" (blue). It makes sense, therefore, that anthocyanin pigments are responsible for the blue, purple, and red color of many fruits, vegetables, and flowers. When it comes to food, anthocyanins are little health workhorses. They're associated with a decreased risk of many illnesses including cancer, high blood pressure, and even Alzheimer's. Fruits and vegetables that are brightly colored are even better for you. That helps explains why pomegranates, blueberries, broccoli, and red grapes are on virtually every Top 10 Healthiest Foods list ever written. 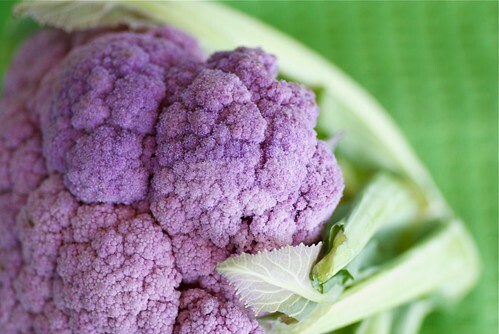 Purple cauliflower, which is currently in season, owes its stunning color to anthocyanins. This cheeky variety, along with its cousins, orange and green cauliflower, have helped make cauliflower fashionable. Use purple cauliflower in cooking as you would use white cauliflower. Steam, saute, bake, or roast it; just don't overcook it, or you'll risk mushiness. If you boil it, add a few drops of vinegar to the water to help maintain its vivid color. The texture is the same as white cauliflower although the flavor is slightly sweeter. One of my favorite ways to enjoy purple cauliflower is in winter salads like this Roasted Purple Cauliflower and Arugula Salad. 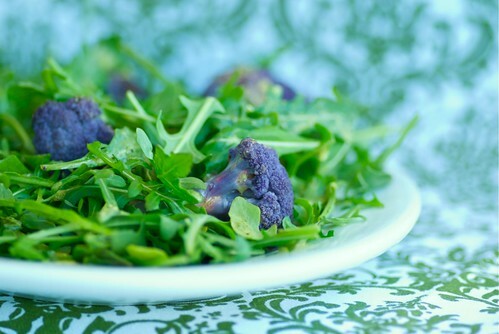 Roasted purple cauliflower and peppery arugula are dressed in a light and refreshing lemon-mustard-rosemary vinaigrette. The flavors match the vegetables' brilliant color making this a winter salad guaranteed to brighten any cold, gray day. 1. Preheat oven to 375 degrees F. Place cauliflower in a large baking dish. Drizzle with 1 tablespoon olive oil and sprinkle with salt and pepper. Toss until coated. Cook for 30 minutes, or until lightly brown and crisp. 2. Whisk all dressing ingredients in a small bowl. 3. Place arugula in a large bowl. Add dressing and toss. Add roasted cauliflower and toss. Serve warm. It's so pretty in that salad! There is nothing better than roasted cauliflower too. I love the stuff. Cauliflower is the one vegetable my husband won't eat. I don't get it. I love it. Maybe if I serve him purple cauliflower he won't know what he is eating. Your salad is gorgeous! What a beautiful salad, and I love the combinations in your dressing too. I've never seen purple cauliflower before...I need to find me some. Lol, it sure puts some of the negative attitudes we have towards food *now* in perspective ;) I just had cauliflower myself just now. Love the stuff :) I would gladly have a plateful of this too! Susan - I was never a cauliflower fan but your picture of this salad may convert me. lol The contrast between purple cauliflower and green aregula is gorgeous. I'm a new reader and fellow San Diegan. Do you get your produce at Farmer's markets? Which one? I go to Hillcrest on Sundays when my garden offerings get sparse or boring. This is how I justify my red zin consumption. The flavonoids, of course! I love the idea of warm roasted cauliflower tossed in vinaigrette. Yum! This would really brighten up a meal Susan. Beautiful. Mix it with some orange and Romanescu cauliflower and that would make quite an attractive plate! This would be a fun ingredient to use for a Mardi Gras themed dish! I love finding purple veggies! I was excited that our local Kroger started carrying purple cauliflower, purple potatoes, and purple green beans (that's kinda an oxymoron...). This looks so yummy! Purple cauliflower?! Now I'm jealous. I am on a mission now to find it. Just started following your blog. Looks great. Susan, thank you for the mention on your post. The salad looks and sounds delicious. Isn't purple cauliflower so much fun. I love picking up all different colors as it adds a little variety to dinner and to cauliflower! These colors are so pretty, and the vinaigrette sounds delicious! The color of the cauliflower is beautiful! This is a lovely salad, Susan. Healthy cauliflower, arugula (my favorite!) and a killer dressing. Way to go! This is a really strange thing to say but...I think purple cauliflowers are so pretty that they could be a centrepiece! :) Okay, maybe it's strange. Love to read posts by someone else spreading the good news about anthocyanins! As a biology buff and foodie, I try to eat as many colorful foods as possible. The deeper the hue and brighter the better, as long as bright's not white. Thanks for the post. What amazing color! We don't get that much over here but when I spot some I'll make sure to grab it! I just love the colour of the purple cauliflower. Sounds like a great salad! That's so cool. I have to troll the farmer's markets now to see if I can find any purple cauliflower! wow what a beautiful salad. I would have never thought to add cauliflower to arugula, but it looks like a great pairing. I too make a lemon mustard dressing for my arugula, but the rosemary addition sounds lovely! can't wait to try it! I've been looking for a reason to buy those beautiful purple cauliflowers from the farmers market! What a beautiful and easy salad. Love those flavours and colours! I've never seen purple cauliflower before. What a great find - perfect to brighten up our long winters. Such a beautiful colour theme! maybe if I buy an exciting purple cauliflower like that it will entice my son to eat some veggies!